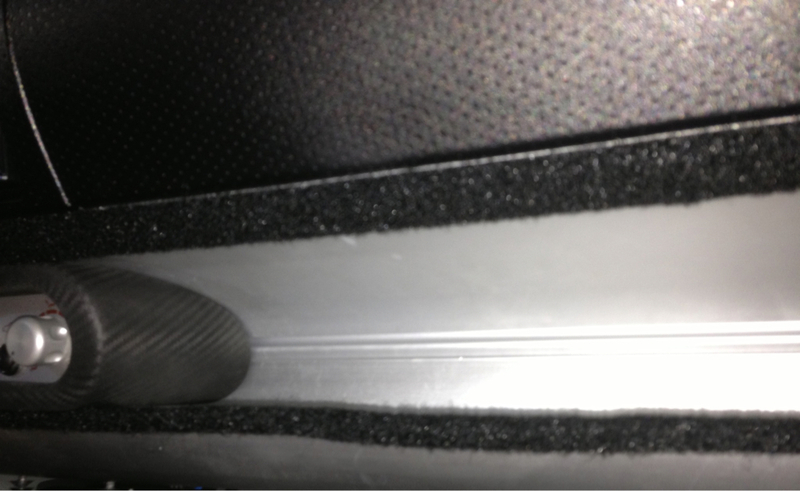 Does the velcro just stick to the OUTER edge of the aluminum tray and the glovebox 'rests' on it, or do you do something with removing the black AC control bezel and the bottom edge of the glovebox sort of 'slides' into the tray and the top is secured by velcro? Sorry for being dumb, but I bought mine used of another forumite who took it off his car. If it just sticks with the velcro on outer edges, install should take 10 seconds. If some of you said 10 minutes, I guess I'm missing something. Any info is helpful and feel free to post an install pic (every pic we have is finished product). You remove the AC bezel so you can put the Velcro on the tray, top and bottom. The top you tuck the Velcro in as far as you can, so not to see the aluminum. The bottom, I put in on the glove box. I lined up the top so it's nice and even! Then push the bottom on. Push hard to stick to the tray. I then pulled the unit off slow, stuff really grabs. Release the top first. When pulling the bottom, it will try and pull the Velcro off the tray some. Once unit is off, fold the bottom over so it sticks really good to the tray. Put the AC control back in. Done, put glove box back on and you should not see any Velcro or very little! Congrats on the birth of your new son, glad to hear mother and baby are well. Thanks for your greeting, Rascal. We are very happy with the new family memeber, very tired, but very happy! Ken, Thank you so much for your great helps on writing this out! Please let me know if you have any question on the instruction when you get it. Will do my best to help on! Installed mine. Again, I have the '08 'sensusoft' interior which has a rubbery coating and is more deep charcoal. - Can of black Plasti. Added some white to get a perfect match. - Mixed with 50:50 of Naptha. - Put into a $5 Preval sprayer. Looks incredible and matches perfectly. Spraying plastidip through a preval (thinned) gets a finish that is LIGHT YEARS better than out of the rattle can. Wow, I admire your details of work (no compromise)! It looks perfectly matched up, great job!!! where are you guys getting the cool emblems? Nexus gen 2 custom made radio Bessel. Elise 07 - My DD (2014-). I tried that but didnt find anything, I tried again with "elise decal" and now I see them. I guess ebay puts this (fits: Elise) in every thing I search for? Stupid ebay. Actually using -(fits: Elise) gives best result. Cant wait for me GB! Last edited by ulao; 03-26-2014 at 10:18 AM. This guy - and he sells all the variants. Lotushii, are you still selling these? ehowton, thank you so much for your compliment...! I guess you are talking about my pictures...right? haha that is the exact one I ordered. If you want the new Chrome OEM one from lotus, here is the part. ulao, thanks for the picture. It looks great, and I like the emblems too! Good job!